How to Take Hydrochlorothiazide. Hydrochlorothiazide is a drug used to prevent water retention in patients. It is a diuretic, or "water pill," that removes salt from your system to stop water retention. Hydrochlorothiazide can be used to lower blood pressure and to treat edema in people with kidney disorders, liver disorders and congestive heart failure as well as those who have overused steroids or estrogen. Take Hydrochlorothiazide exactly as your doctor or the prescription bottle tells you to. Always follow your doctor's instructions. If your doctor tells you to change your dosage from the amount on the prescription, listen to your doctor. Take Hydrochlorothiazide with a full glass of water and drink plenty of water during the day while taking this medication. If you don't, you can become dehydrated. Have your blood tested regularly while taking Hydrochlorothiazide to ensure the medication is working correctly. Do not skip any scheduled appointments to have your blood tested while taking Hydrochlorothiazide. Inform your doctor that you are taking Hydrochlorothiazide if you need to have a thyroid test. Hydrochlorothiazide can interfere with thyroid test results. Take any missed doses of Hydrochlorothiazide as soon as you remember, unless you are close to the time for your next dose. In this case, you should skip the missed dose and continue taking Hydrochlorothiazide as prescribed. Store Hydrochlorothiazide at room temperature. Avoid exposing Hydrochlorothiazide to extreme heat, light or moisture. Continue using Hydrochlorothiazide even if you feel fine, if you are being treated for high blood pressure. Stopping Hydrochlorothiazide could cause the symptoms to return. 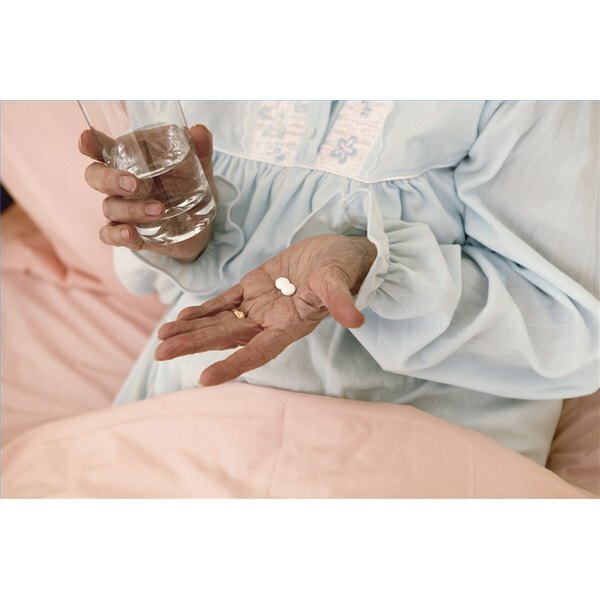 Tell your doctor if you are suffering from diabetes, gout, kidney disease, liver disease, asthma or allergies before taking Hydrochlorothiazide. Minor side effects from using Hydrochlorothiazide include diarrhea, stomach pain, constipation and blurred vision. If you suffer from any of these side effects, you should continue your prescription and call your doctor. Do not take Hydrochlorothiazide if you are breast-feeding. The medication can pass in breast milk and harm young children. Do not take Hydrochlorothiazide if you are allergic to sulfa drugs. Symptoms of an overdose of Hydrochlorothiazide include dry mouth, nausea, dizziness, weakness, thirst and muscle pain. If you are having any symptoms of an overdose, you should seek medical attention immediately. Do not drink alcohol while taking Hydrochlorothiazide. Alcohol increases the risk of side effects from taking the medication. Do not take medications that make you light-headed while taking Hydrochlorothiazide. Medications such as narcotics for pain, seizure medication and muscle relaxers can add to the side effects from Hydrochlorothiazide. Watch for serious side effects of Hydrochlorothiazide. Serious side effects include vomiting, thirst, dry mouth, nausea, weakness, drowsiness, light-headedness, restlessness, abnormal heartbeat, numbness, tingling, a red blistering skin rash, stomach pain, low fever, poor appetite, clay-colored stools and jaundice. If you suffer from any serious side effects you should stop taking Hydrochlorothiazide and seek medical attention. Certain drugs can cause an adverse reaction when taken with Hydrochlorothiazide. Inform your doctor before taking Hydrochlorothiazide if you are currently taking or have recently taken lithium, digoxin, cholestyramine, colestipol, steroids, blood pressure medication, aspirin, ibuprofen, diclofenac, indomethacin, naproxen, piroxicam, nabumetone, etodolac, insulin or any other diabetes medication you take by mouth. Other drugs than those listed could cause a reaction when combined with Hydrochlorothiazide. Inform your doctor of any prescription, non-prescription, vitamins or herbal supplements you are currently taking.